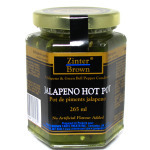 Zinter Brown Garlic Pepper Pot is a unique twist on ordinary garlic pepper jelly. 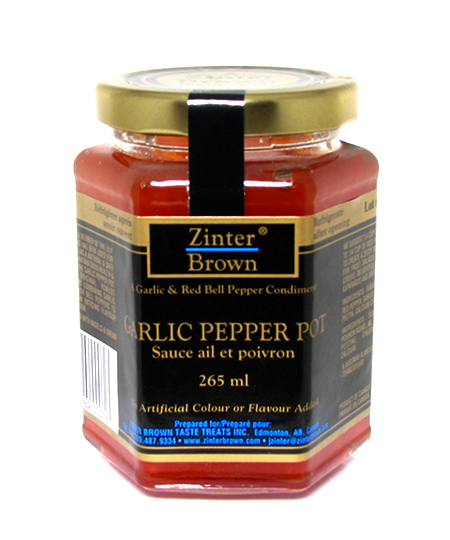 A carefully selected combination of fresh roasted garlic and red bell peppers is simmered with sugar, water, pectin, vinegar and gourmet spices to create an unrivalled taste sensation. Add garlic pepper jelly to your favorite meal or appetizer recipes or try our gourmet recipes. 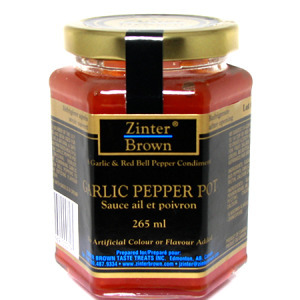 Use Zinter Brown Garlic Pepper Pot as a glaze for roasts, steaks, chops, burgers or wild game. Garlic pepper jelly adds personality to soups, stews, casseroles or meatballs. 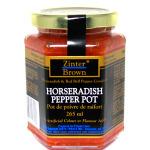 Perfect as a dipping sauce for samosas or chicken fingers. Create a distinctive Asian stir-fry with our gourmet pepper jelly. 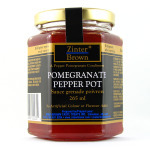 Add creativity and simplicity to your meals with the superior taste and quality of Zinter Brown taste treats. Buy jelly online spices or condiments. International shipping available.